When you think of big European beer companies, Efes wouldn't even get a mention. The huge number of German, Dutch and Belgian beers that we drink here would certainly be ahead of this beer in most people's thinking. Staggeringly this is the 8th largest brewery by total sales numbers in Europe and the 12th largest in the world! I'm absolutely astounded by that statistic, it's even harder to believe when Turkey doesn't even rank in the world's top 50 beer drinking nations. The German Pilsner style does mean that it is a highly universal beer, but to have sales that high it must be a damn good beer! I acquired the glass at the Turkish kebab shop where I had lunch today, not kidding, and the kebab man told me that the beer is better than any Australian beer, I highly doubt that but here's hoping it's decent. The pour is a clear straw colour, with little carbonation and a very small head. The head that is there appears to be quite firm but does disappear very quickly. The photo indicates this, it was literally taken within 30 seconds of pouring! Other than that it's not a very notable beer, it looks average for the style however I would have liked some more head, a good pilsner should always be able to lace the glass. 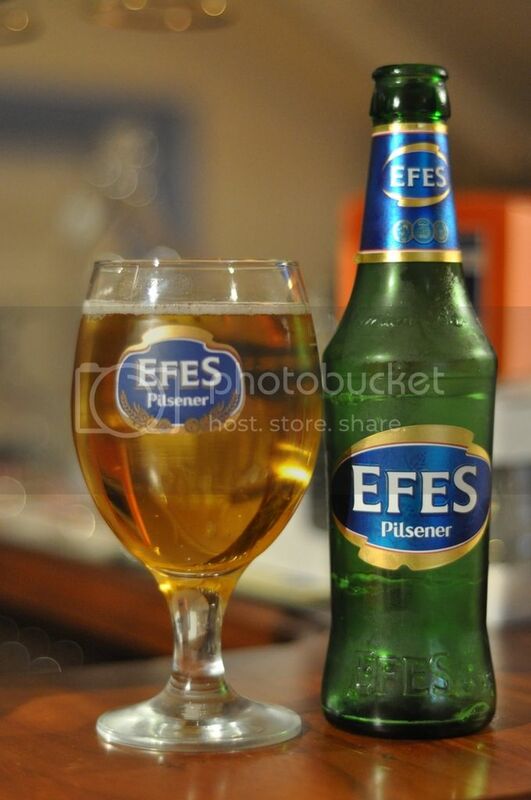 Efes is quite an easy beer on the nose, it has a sweet malt character which seems rather full-bodied for this beer. The beer appears well balanced with some spicy hops and there is also this rather strange corn odour on the end of the aroma. I can't hazard a guess as to what may cause this because otherwise the beer smells really well thought through. The sweet malts really dominate this beer. They are quite full-bodied in flavour for this relatively light beer, the malts have this strange corn taste at the end which I am going to have to attribute to poor travelling conditions. The spicy hops are quite a strange flavour and unfortunately seem to be swamped by the sweet malts, counteracting the bitterness the hops were beginning to release. The beer finishes with a crisp citrus flavour. This is quite a nice German style pilsner. It doesn't have the massive flavours of a Czech pilsner, but is light not overly carbonated and very pleasant to drink. It may be a tad sweet for some, but I think this would be a great beer for a hot day, like they have in Turkey. By no means is this a spectacular beer but as far as mass produced beers go it's very good, I can now fully understand it's immense sales worldwide. Definitely one to try and you can get it at Dan's for about $3 a bottle, give it a go if you see it.